Xbox Play Anywhere is a special label given to select video games released on Microsoft's Xbox One console and Windows 10 PCs. Buying a game with the Xbox Play Anywhere label on Xbox One will unlock it for free on Windows 10 devices and vice versa. All of the titles with this branding also support many popular Xbox Live features that are common with regular Xbox One console games such as Xbox Achievements and free cloud saves. Can I Be Signed In To The Same Game On My Xbox Console And My PC? Yes, you can. Anytime you play your game, progress is saved on Xbox Live, which is cloud-based. That means that, regardless of where you play a game, you can always start playing again from the same spot in the game on another device. All your saves, game add-ons, and achievements go where you go. Should I Buy Games on Windows 10 or Xbox One? It doesn't matter. All Xbox Play Anywhere video games support full cross-buy functionality which means that if someone purchases an Xbox Play Anywhere game on their Xbox One console, they will automatically gain the Windows 10 version for free as long as they use the same Microsoft/Xbox account on both their console and PC. The reverse is true for those who buy a title on their Windows 10 device in the Windows Store app. There are no extra steps that need to be made beyond buying the game and it doesn't matter which device you make the purchase on. While all Xbox Play Anywhere games support Xbox Live features such as leaderboards, friends, Xbox Achievements, and cloud saves, not all games with the Xbox branding support Xbox Play Anywhere. Games that support Xbox Live features can be identified by the Xbox Play Anywhere icon. This will usually have the words Xbox Live, Xbox 360, or Xbox One written on it. Games with Xbox 360 and Xbox One written on their graphics are available on their respective consoles while those that use the Xbox Live label can be found on Windows 10 devices and Windows phones. Xbox Play Anywhere functionality is usually listed within the video game's description in the digital storefront often near the title and under the "Ways you can play" subheading. The cross-buy benefits of Xbox Play Anywhere titles only extends to the digital versions of the games. Buying the digital version of ReCore on Xbox One, for example, will unlock the Windows 10 version for free but purchasing the physical disk version of ReCore for Xbox One won't. Do Xbox Play Anywhere Games Work on All PCs? When buying games with the Xbox Play Anywhere label, there are two things to check: Your PC's operating system and its hardware profile. Xbox Play Anywhere will only work on PCs running Windows 10. 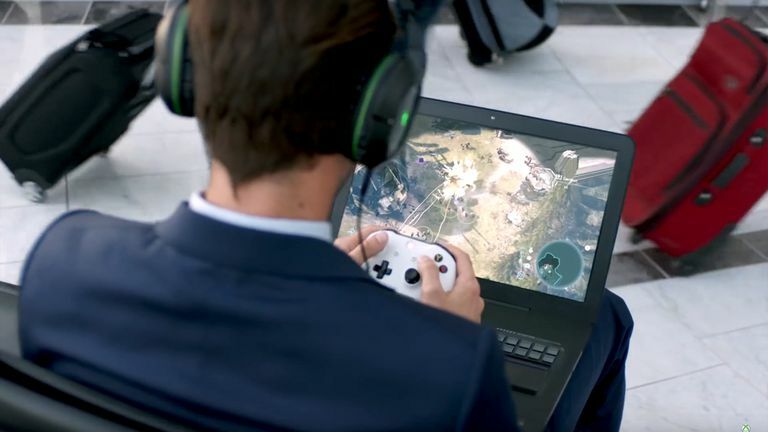 So in addition to the added security benefits of upgrading your device, installing Windows 10 will also provide a better gaming experience as well. The second thing to consider is your hardware compatibility with the game. Many games have certain memory and processor requirements. Thankfully, the official game listings within the Windows Store app in Windows 10 automatically tests a device for compatibility. This test can be found under the Features part of a listing and is visualized by green ticks and red crosses to indicate if the game will run properly. If there are green ticks next to all of the entries under System Requirements then you're good to go. If you're presented with several red crosses or see the message 'Your device must meet all the minimum requirements to open this product' with an OS recommendation below the message, then you may need to buy a more powerful computer. Keep in mind that all games are different and while some may not run on your current computer, several others might. The number of video games that support Xbox Play Anywhere continues to increase on a very regular basis. Here are five titles to get you started whether you're playing on Xbox One or Windows 10. Killer Instinct: Killer Instinct is a reboot of the popular fighting game from the 90s of the same name. This game is free to download and play however characters must be purchased before they become playable. There is one free character to play that rotates on a weekly basis in the regular version of the game while several bundles are available to buy which come with a variety of characters. Killer Instinct may be considered too violent for younger players but teenagers onwards should be fine. ReCore: This female-led adventure game features a good mix of action and puzzle solving that should keep most average gamers entertained. ReCore was one of the first Xbox Play Anywhere video games and is made by the same creator of Metroid Prime, Keiji Inafune. Forza Horizon 3: By far one of the most visually impressive racing games ever made, Forza Horizon 3 takes the open-world car franchise to Australia and explores the countries varied locations such as the beach, bush, outback, and modern cities. This game is ideal for any age group though adults will appreciate the title's attention to detail more than young players. Voodoo Vince: Remastered: Voodoo Vince is a 3D platformer that was first released on the original Xbox console back in 2003 and has now been remastered for a more modern experience. This title will appeal to fans of the 3D Super Mario Bros games. A Walk in the Dark: This 2D platformer boasts a unique artistic design that sets it apart from its rivals and gives it an edge that many other games in the genre lack. Fans of the traditional Super Mario Bros and Rayman games will get a lot of enjoyment out of this game.